Find out if the Microsoft Surface Go is the best travel laptop for your needs. If you are a traveler who needs to stay connected, then you know the deal. Your need to find the right tools to bring along with you is one of the top things to keep in mind. If you ask any traveler, especially many digital nomads, they will tell you that having a great laptop is a must. While it might seem like picking out a laptop is not such a burdensome task, you do actually need to put a lot more thought into it. With the range of laptops available right now, it has never been easier to sift through and find the perfect laptop for your travels. Today, we are going to look into one specific laptop from Microsoft's latest lineup , the Microsoft Surface Go. Could the Microsoft Surface Go be the next great laptop for you and your travels? Read on to find out! When it comes to picking the right travel laptop, one of the main things you need to ask yourself is this: What do you need your laptop to do for you? If you are looking for a go to laptop to use on simple day to day tasks and activities, then a mini laptop such as a Microsoft Surface Go could be your best bet. Unlike many high end laptops on the market right now, the Microsoft Surface Go was designed for the traveler who needs simple tasks to be completed while they are on the road. Tasks such as checking email, connecting on messenger, and updating Google files are all things that the Microsoft Surface Go was designed to do. 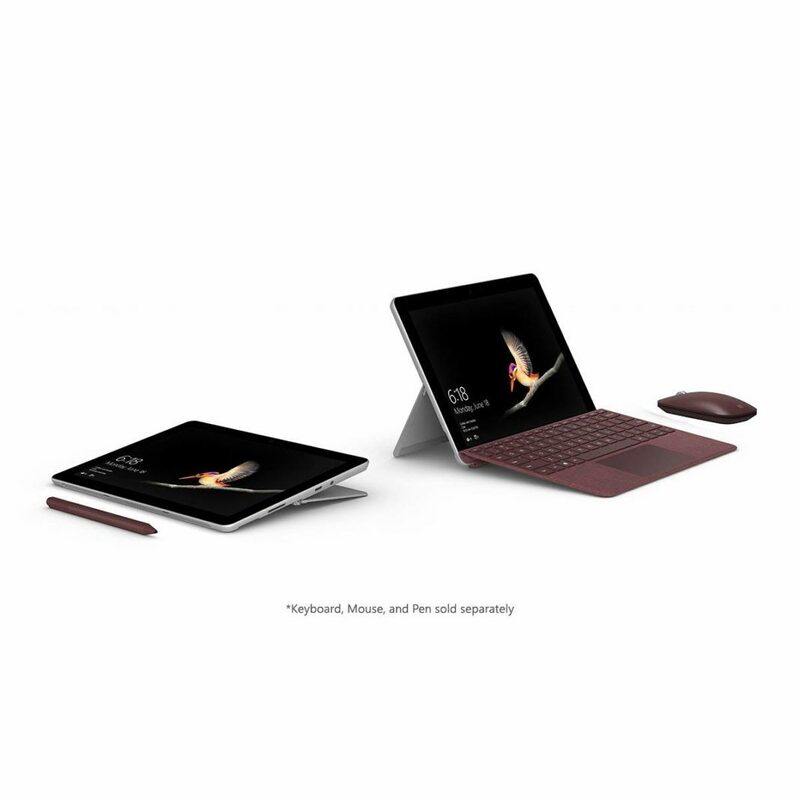 As you will soon see, the Microsoft Surface Go was not designed to be an in depth product that has the ability to run high demand applications. Rather, it was designed to be a tool that every traveler could use for daily activity instead. In addition to that, because of the cool style is, graphic designers and artists simply love the Microsoft Surface Go. Designing and creating on it has never been easier thanks to its easy to use features. In today's review of the Microsoft Surface Go, we are going to take an in- depth look at what makes this one of the best mini laptops on the market right now. We are going to jump right into the specific features and benefits that the Microsoft Surface Go offers travelers. If at the end of the review you decide that this might not be the best laptop for you then hang tight. You will find that we have listed three of our favorite alternative laptops. These alternative laptops are great options to go with as well. It will be helpful especially if you are looking for a laptop that can handle a more demanding workload. With that being said, let's begin with our overview of the Microsoft Surface Go. The new Microsoft Surface Go is one of the best travel laptops to pack along and bring with you on your adventures. Today, we are going to dive into all the features and benefits that make this laptop such a great guy. Here are some of the favorite features that make this laptop stand up against the rest. The overall design of the new Microsoft Surface Go is one that will make you do a double take. For starters, the Microsoft Surface Go looks a lot like its big brother, the Surface Pro. However, it is slightly scaled down a bit. Everything from the keyboard to the screen was shrunken down for your accommodation. The Microsoft Surface Go weighs in at 1.15 lb (Without the keyboard case). That allows it not only to be lightweight but super portable too. In addition to this weight, the screen size measures out at 10 in. While this tablet size might be a little smaller than many travel laptops, it certainly still allows you to get the job done. The overall measurements are what constitute it to be a "mini laptop". When it comes to the overall look, travelers will be pleased. The Microsoft Surface Go sport and edgy look that is hard to ignore. The screen is nice and glossy and clean and it is framed with a beautifully rounded bezel for a look of sophistication. This design also makes it super easy to carry this tablet around too. What we love about the Microsoft Surface Go is the designers clearly took their time to make this laptop stand out and stay trendy. This is something that many travelers can agree is an important feature to them when they are shopping for a laptop. 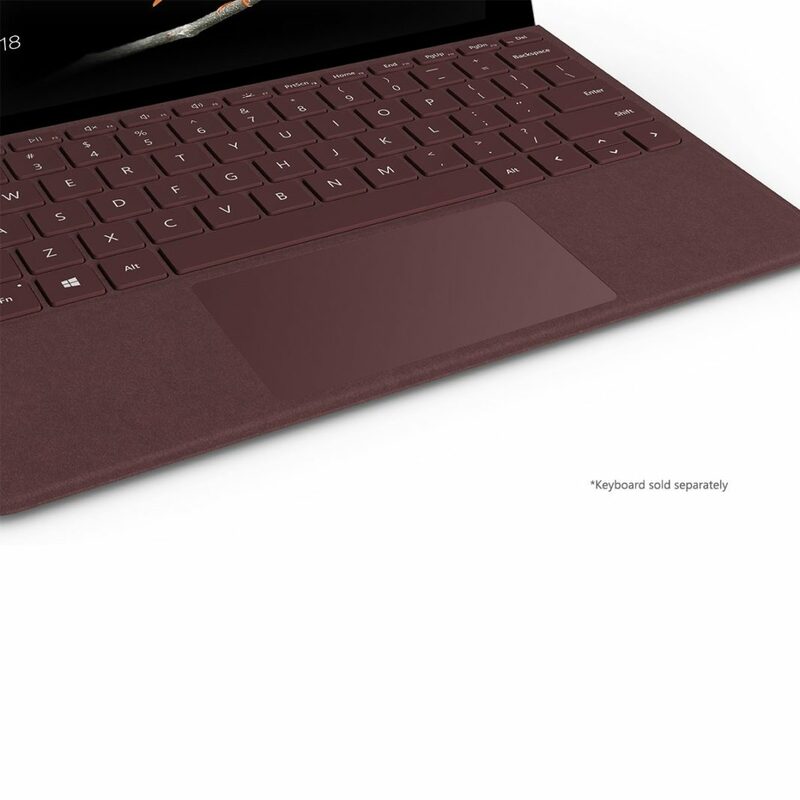 As far as the materials used, the Microsoft Surface go is designed with an all magnesium back cover. This material makes it super lightweight and easy to carry around. In addition to that, the Microsoft Surface Go allows travelers to use a stylus that easily attaches and detaches from the top of the tablet. The tablet cover also serves as a really great keyboard. When you flip the tablet portion over to the back, you find the easy to use stand. This stand is what allows you to convert your Microsoft Surface Go from a tablet to a laptop. 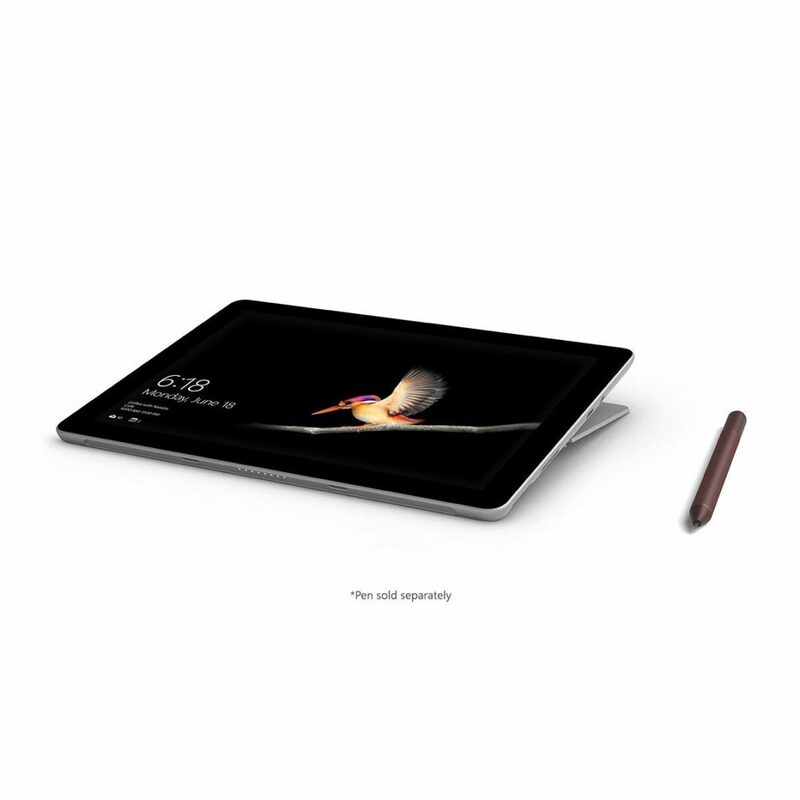 The display of the Microsoft Surface Go measures out to 10 inches in diameter. This is slightly smaller than your typical compact laptop. However, it is the same size as roughly most tablets on the market right now. Along with that, the screen features 1800 by 1200 pixels and touchscreen capabilities. Compared to its counterparts, this resolution is a bit lower. For example, its noteworthy competitor the iPad measures in it 2048 X 1536 pixels. For your typical everyday uses, the display is up to the task. You can easily browse around the internet, watch movies, and view photos with complete color accuracy. Along with that, you can do most everything that you want and expect to do on a tablet. When you flip the Microsoft Surface Go to the side, you will find that the speakers reside in the thickly framed bezel. Surprisingly, the audio system on the Microsoft Surface Go is one that deserves a head nod. For such small drivers, the speakers offer a surprising punch of power. If you are working in a calm environment, you can easily play music without having to worry about quality too much. The Microsoft Surface Go is powered by Pentium. Microsoft has opted to switch out the Core i-series Intel CPUs for some of the lower end Pentium processors. This is due to a multitude of factors. One of the main factors is the fact that this tablet was not designed to carry a heavy load of operating features. In fact, when it comes to lower priced laptops, you will typically find a Pentium processor. In addition to that, the Pentium processor was primarily designed to allow users to surf the internet and really not do much more than that. Not only that but if you use tools such as Google Docs on a regular basis, then this can be a great mini laptop to bring along with you on your travels. The Microsoft Surface Go easily runs applications such as Google Docs and Google Sheets without fuss. In addition to the display, you will find that the Microsoft Surface go features a USB C port and a MicroSD card reader. What makes this tablet stand out from many of its competitors is the fact that it features these two ports. These can be a valuable addition do your tablet especially if you need to connect other devices or surf through your photos while you travel. 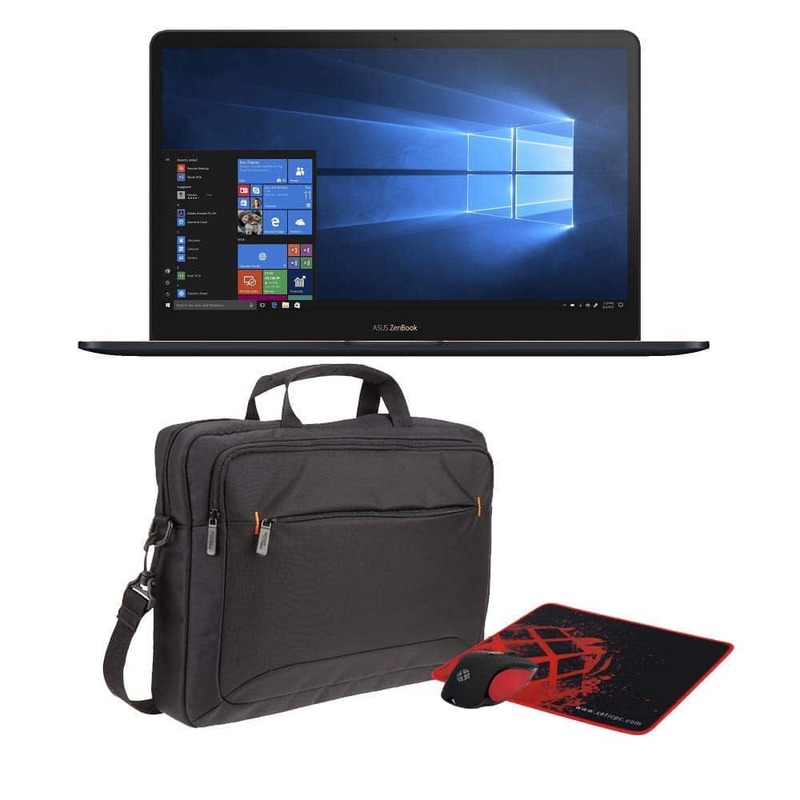 If you are looking for a basic laptop to bring along with you on your travels for simple tasks, then this might be the best mini laptop for you. The good news is that because of this downgrade in the processor, you will see a difference in the price too. This is great news for travelers who are looking for a great mini laptop that will not break their budget. 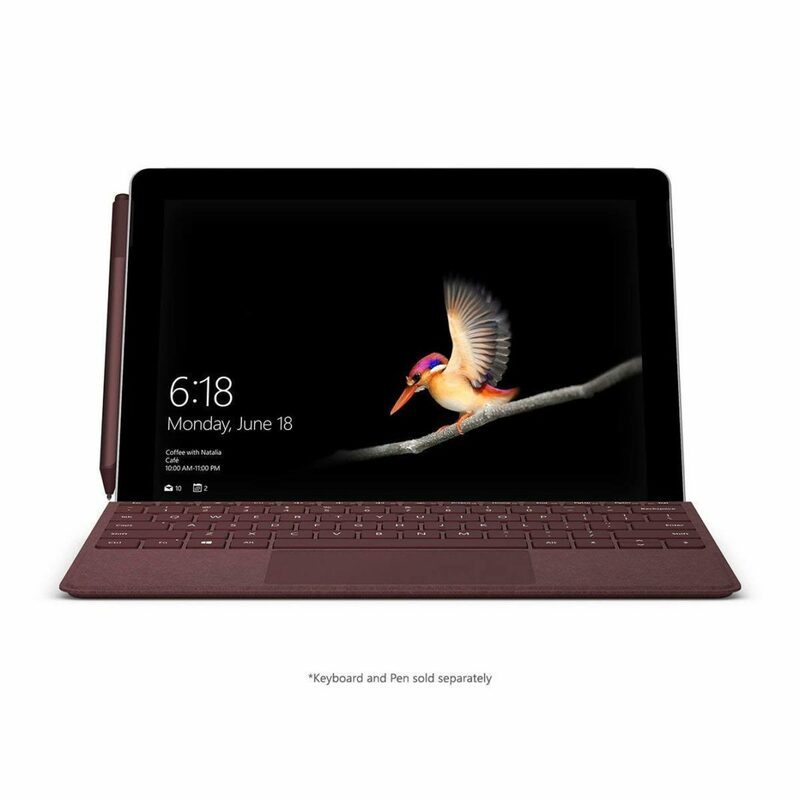 The keyboard on the Microsoft Surface Go is conveniently found on the back of your Surface Go cover. Overall, the keyboard is a nice addition to this tablet. The smaller scale keyboard is easy to use and the keys feel comfortable underneath your fingertips. 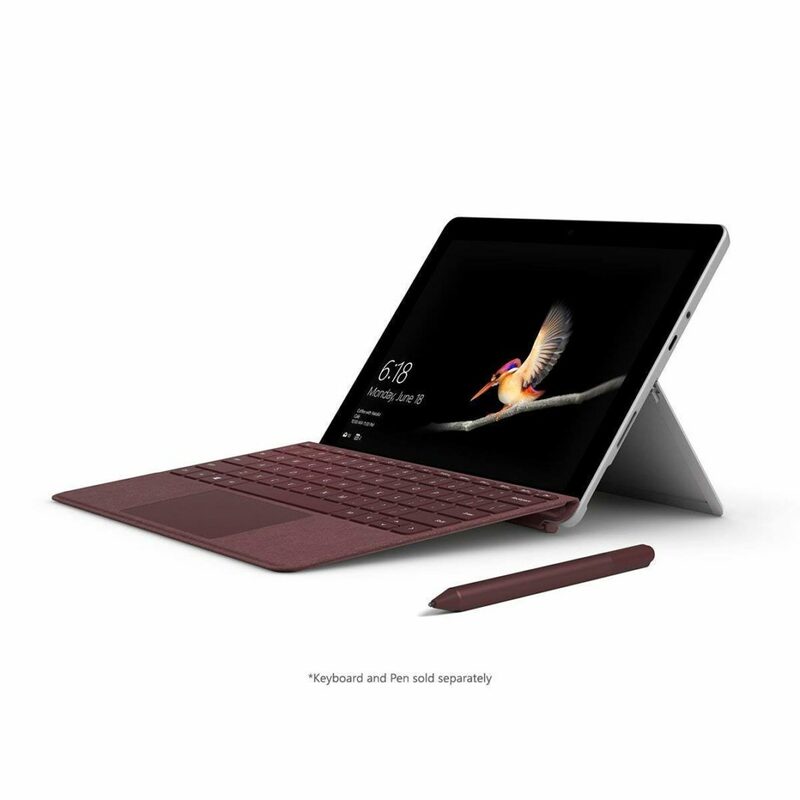 If you are used to the Microsoft Surface Pro and their keyboard, you can expect to find a similar keyboard just slightly a smaller version on the Surface Go. Along with the keyboard, you will find the easy to use touchpad as you normally would on any traditional keyboard. This touchpad is super responsive. If you do not prefer to use the touchpad, then you can continue using the touch screen as you normally would. When it comes to the stylus, it is super awesome and easy to use as well. If you are a traveler who does a lot of designing and drawing, then this is an add on that you want to take advantage of. The stylus allows you to create artwork seamlessly and effortlessly. Along with that, the stylus allows you to pull out the Microsoft Surface Go anywhere and hop right into your work. Lastly, it should be noted that the additional features such as the stylus and the keyboard are sold separately. While this can be a bit frustrating, all who use Microsoft know that this is the way that Microsoft operates. Luckily, when you shop the keyboard, you do have a range of styles to choose from. You can find the Alcantara fabric keyboard cover in a range of colors including burgundy, cobalt, and a range of platinum colored covers. The Microsoft Surface Go conveniently comes with a range of storage and memory options. What makes this great is the fact that you can shop specifically for what you need. If you are looking for a great mini laptop but are on a budget, you can scale back your needs to find the one that is most affordable. Currently, the storage options feature either 4GB or 8GB memory capacities. If you are looking for a simple laptop to get day to day activities done on the web, then the 4 GB of RAM could serve you well. However, if you are looking for a little more memory, then you will want to opt for the 8 GB of RAM. As far as storage goes, you have three options to choose from. You can find the Microsoft Surface Go in 64 GB as well as 128 GB. Again, selecting which option for you depends on your need. If you will be downloading a lot of apps and using a lot of applications, then you obviously want to go with more storage capabilities. We love that the Microsoft Surface Go is super versatile. You can literally unpack it and use it with ease. The flexible keyboard cover allows you to turn your tablet into a laptop within seconds. In addition to that, we love that the kickstand offers a great way for you to comfortably use your laptop while you are on the go. In addition to that, because the Microsoft Surface Go is super lightweight you literally will not feel yourself carrying it around while you are on your travels. It will easily slip into any storage bags and tote bag with ease. Figuring out a way to bring it along is not something that you will have to worry about. 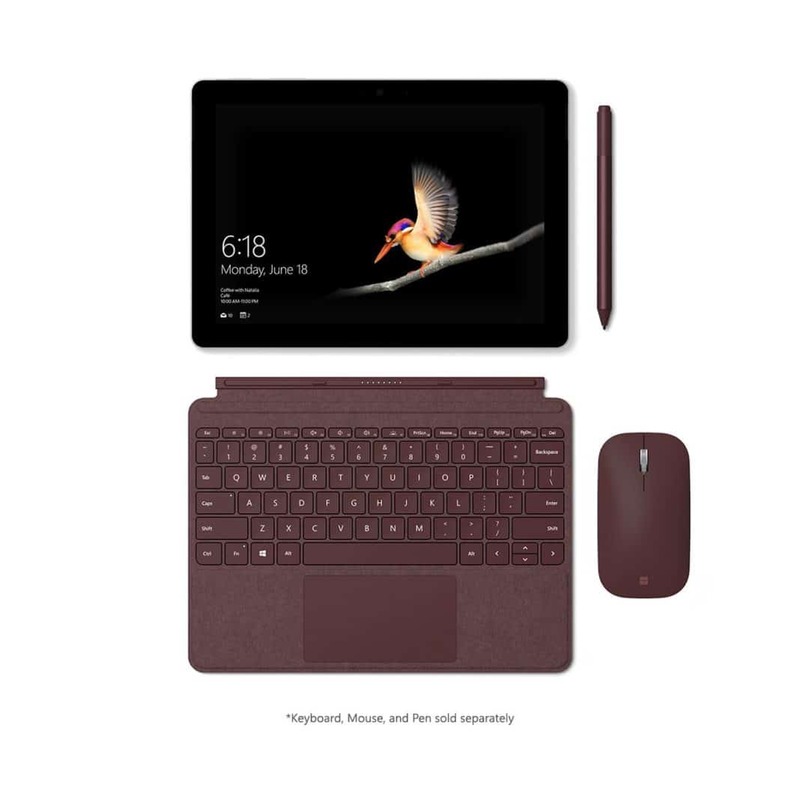 The Microsoft Surface Go comes in a range of prices because there are different types that you can choose from. Of course, if you are looking for something a little bigger in terms of display and performance, then you will certainly want to aim for the 8GB of RAM and 128gb of storage. For this Microsoft Surface Go, you will typically be looking at about $500. If you are searching for a cheaper option, then scale back your capacity needs. When you drop down to 4 GB of RAM and 128 GB of storage, you will typically find the Microsoft Surface Go anywhere from the mid $300 to $400. Lastly, if you are looking for something to simply get the job done, then you will want to aim for the lower end of the Microsoft Surface Go. This model features 4 GB of memory and 64 GB of storage. You can typically find the Microsoft Surface Go at this capacity for anywhere around $300. When it comes to the additional add ons such as the stylus and keyboard, you will be looking at spending an additional couple of hundred bucks. 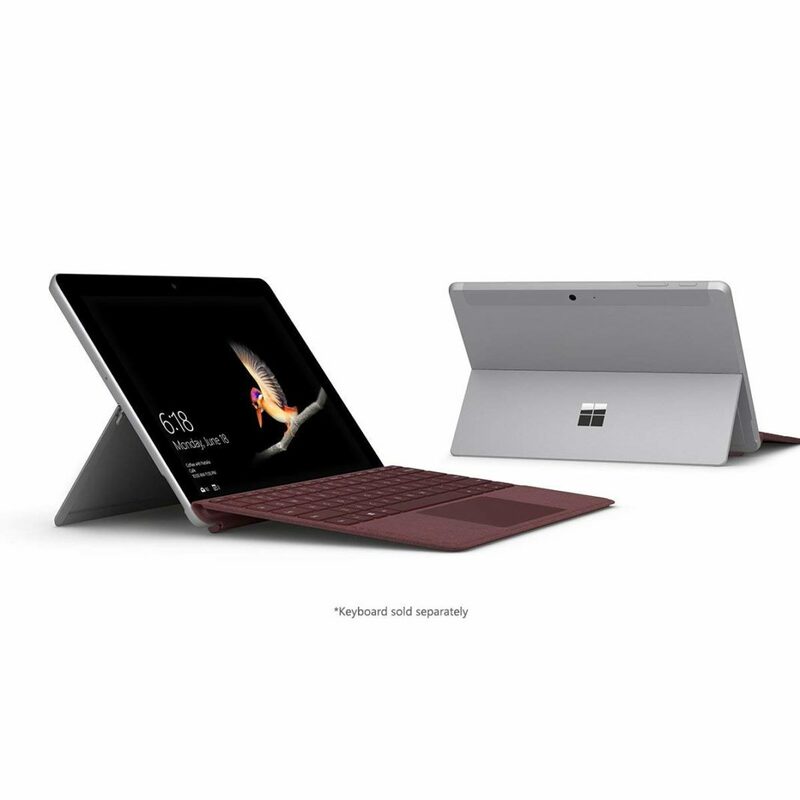 While it is an annoyance to purchase these separate accessories, they do you enhance the overall experience of the Microsoft Surface Go. The price point behind the Microsoft Surface Go is designed to target travelers who do not need a lot out of their mini laptop. Because of this, the downgraded capabilities have given way to affordable prices that will not break the bank. Because of the flexibility in product options, the price point is a rather fair one. While we would have liked to see the Microsoft Surface Go be sold alongside the keyboard and stylus, we do have to accept that this is how Microsoft has typically always done stuff when selling their products. Overall, the price point is a fair one and can be attractive to travelers who are shopping around on a budget. It is understandable that the Microsoft Surface Go might not be for every traveler. If you are a digital nomad who demands a higher end laptop to get all your work done, then hang tight. Check out three of our alternative laptops that we have listed below. You may find that the best travel laptop for your needs could be one of these. One of the best laptop to include with you on your travels is this next laptop. The ASUS Zenbook 13 UX331UN is a show stopper that is hard to ignore. For starters, the Asus Zenbook packs a great punch. It's not only for its size but for its price point too. If you are an adventurous traveler, this laptop can easily meet the demands of all your travels. Especially if you are traveling around with your laptop for the first time. For starters, the ASUS Zenbook 13 UX331UN is incredibly great in its design. The design offers travelers a sleek and modern style that looks good on any traveler. In addition to the design, it is one one of the few computers that were designed to be toted around with you. You can effortlessly pull it out on a plane or train and get to work. Not only that, but the design of the ASUS Zenbook 13 UX331UN allows it to comfortably fit in your lap no matter where you are. The tech specs are not the only thing that makes this laptop awesome. Travelers will find that the ASUS Zenbook 13 UX331UN can handle a wide range of activity at the same time. For example, travelers can easily watch clips on YouTube. All while downloading music and browsing through 20 or more tabs. You do not have to worry about the ASIS slowing down because your ASUS Zenbook 13 UX331UN will be able to withstand high demand activities. This performance coupled with a responsive touchpad and easy to navigate screen is what makes this laptop stand out as well. These features make it one of the best travel laptops to bring with you on your travels. Digital nomads are sure to love the ASUS Zenbook. It will get all your work done easily and effortlessly while you are out exploring. There are so many ways in which this next product is similar to the Microsoft Surface Go. The iconic brand Apple is known in the technology world as one of, if not, the leading technology brands. This is especially true When it comes to their awesome line of laptops. In fact, an awesome travel laptop that you can not go wrong with is the iconic MacBook Air. Simply put, the MacBook Air is one of the best laptops to carry along with you on your travels. It is no surprise why either. This operating system and all that it has to offer makes it one of the best laptops to bring with you on your travels. 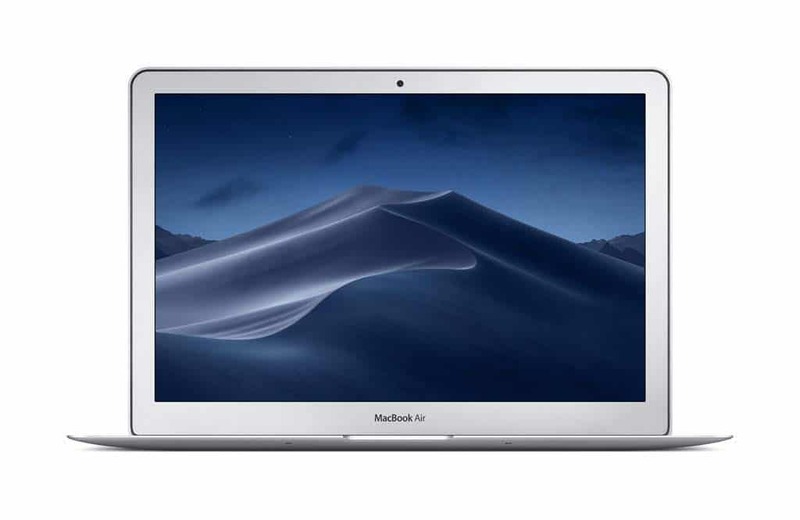 The MacBook Air is one of the top notch quality products on the market right now, especially when it comes to computers. Not only that, but its overall look is one that is so iconic, you can not ignore it. It offers travelers a sleek design. This sleek and compact design can come in handy when you are packing for a trip. You can pack it along in your travel bag and not have to worry about whether it will not. Lastly, another thing you should keep an out is the performance of the MacBook Air. The performance is something that certainly deserves a head nod. The powerful performance will allow you to get all your work done with a without too much fuss. For starters, the display on the MacBook Air is pretty awesome. It has a retina display that offers users a crisp and clear image. This image is one that makes a world of a difference. For travel photographers, you are sure to enjoy the clarity that you can expect to get when you are editing your work. In addition to the Retina display, the performance of the MacBook Air is simply unmatched. You can work on it for hours on end without having to worry about whether or not your computer will be able to handle it. The processing power of the MacBook Air is quite impressive. Lastly, one of the most important features of traveling is making sure that your devices stay properly powered. Thanks to the two USB ports available on the MacBook Air, you can always stay connected and in sync with your external devices. If versatile is an important factor in your laptop choice, then this next product is a great one to look at. 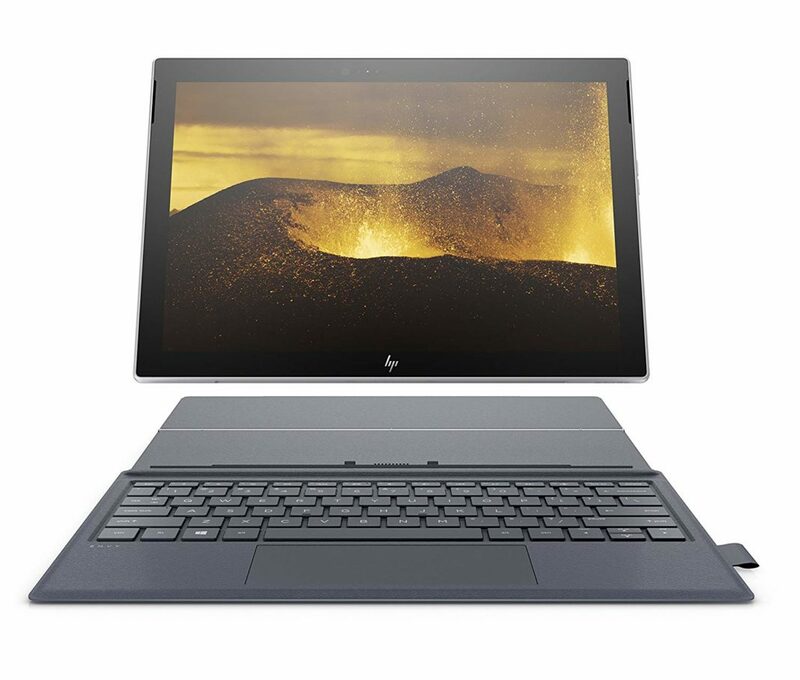 The HP Envy x2 Mini Laptop is easily noted as one of the best and most versatile laptops on the tech market right now. Much like the Microsoft Surface Go, this laptop conveniently has the ability to switch from a tablet to a full on laptop. All you need to do is simply disconnect the screen portion and detach it from the keyboard. After you have done that, you will have a full functioning tablet. This tablet them becomes a device that is as powerful as it is versatile. The versatility is not the only awesome feature. The HP Envy it is simply one of the best laptops to bring along with you if you travel often. This is because it is super travel friendly and can pack away easily. Wherever you are, you simply need to pull out your tablet and get to work with ease. If communication and staying connected is necessary for you on your travels, then this computer is for you. The HP Envy x2 Mini Laptop offers two cameras. These cameras allow you to communicate easily and efficiently on platforms like Skype with ease. You can make video calls without a hassle so that you never miss a beat. Lastly, one of the best features of the HP Envy X2 is the fact that it is dependable. You can always have your devices close by and connected thanks to the dual USB - C ports. These ports will ensure that your devices can stay charged up and ready to go whenever you are out. When you are out and about, having the right travel laptop can make or break your trip. This is especially true if your travels demand that you stay connected. When you are traveling with the Microsoft Surface Go, you have the ability to do both. You can get all your work done without having to worry about your technology failing you. If you want to get your hands on your own Microsoft Surface Go, Click below before you plan out your next adventure.